Rick Peckham is a 1977 graduate of Kent State University with a B.A. in telecommunications. 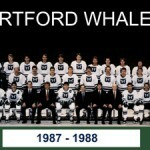 He served as the play-by-play announcer for Hartford Whalers games on SportsChannel New England from 1984 through 1995. The following classic moments from Peckham were generously provided by Bob Joyce.